The year is 2095. Voyager 1 launched in 1977 with a golden record - someone has found it and is sending a signal back to Earth. With a newly constructed faster-than-light spaceship named Antariksh, and a crew which includes novices like Lt. Manisha, as well as seasoned professionals, including Commander Ryan, Captain Anara reaches the source of the signal at the nearest star to Earth - Proxima Centauri. Earth to Centauri is a science fiction book series about a group of astronauts who travel to the Alpha Centauri star system and make first contact with an alien civilization. The writing is good, the characters very satisfying, and the plot is very well balanced and complete. The action starts right away and the pace remains quick. This novel was incredibly difficult to put down. 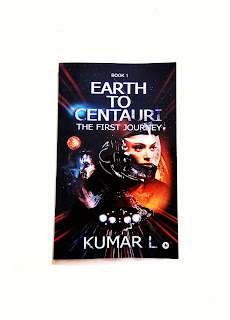 I decided to read Earth To Centuari because of all the great reviews. I don't believe in being genre specific, so I try my best to read a bit of everything; and I am glad I gave this Sci-Fi a try. The author has revealed enough things at a time to maintain interest. It's a good mix of excitement and pace of story made this a fun read. This book was intriguing and I'm definitely looking forward to reading the rest of the series.